Some nice, glossy ink from one of the glitzy magazines we have here that highlight local celebrities… from the mid-winter Aspen Sojourner. My son Ryan thinks this is the best photo of me that he as seen recently. What do you think? 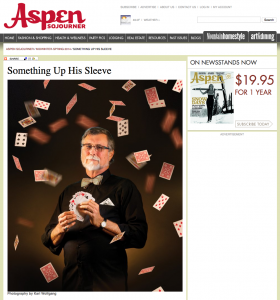 Aspen Sojourner Article “Something Up His Sleeve”.